Course Designers: Thompson,Wolveridge and Perrett. Finna Golf & Country Club Resort is located in a gorgeous valley surround by Mt. Welirang, Mt. Arjuna and Mt. Penanggungan. The spectacular scenery is augmented by abundant tropical flora. You will play shots over rice paddy fields from elevated tees - you could only be playing in Asia! Fortunately relief is given if you end up in the Lemon Grass! The course is in very good condition although I found the greens a little slow. The rough was not too long and generally you could play from it. Caddies are available, and for our group they were excellent. They had delightful personalities and knew the course well. We found the mountain location made a significant difference in how far the ball flew and eventually realised we just had to trust our caddy's decisions. You definitely need a caddy! Holes 10, 11 and 12 were memorable holes. Hole 10 is a par 5 where it is possible for the long hitter to get home in two shots. A natural spring just before the green offers a further challenge and adds to the majestic scenery. Hole 11 is a short par 4 and is a particularly pretty hole surrounded by jungle. With a beautiful tree overhanging the fairway on the right side, you have to make sure you stay left to have better shot at flag. Hole 12 is a longish par 3. From an elevated tee, this a wonderfully framed hole with trees lining the right side and a rice paddy field to hit over. This concludes a majestic trifecta of holes. 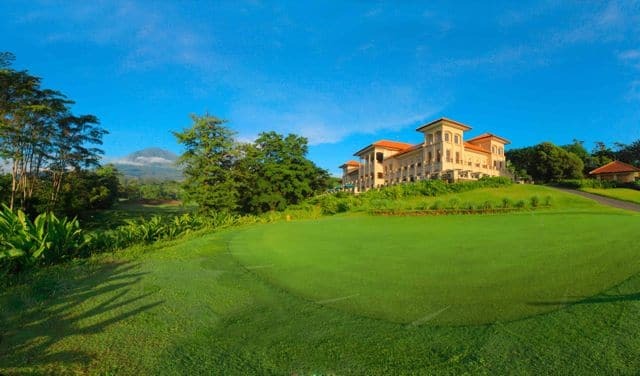 Finna Golf & Country Club Resort offers a quality resort course, which is well maintained, and set in spectacular scenery. The course certainly is challenging, yet fair. You can play from the rough and generally find your ball, especially with the aid of your caddie. The Resort itself has spacious cottages, first class amenities, restaurants and bars . A nice cold beer in the Spike Bar overlooking the course and mountains is a great way to end the round. And then there is the massage!